Stores define the urban landscape. What happens when goods go straight to your home? Iconic department stores like Sears are faltering, malls are closing, and longtime chains like the Gap — once ubiquitous in downtowns and suburbs alike — are shutting stores. There are several reasons for the collapse, but one is the rise of online shopping, led by Amazon and Walmart, which have made it possible to get the same stuff these stores sold without ever leaving the house. In even the most walkable Boston neighborhoods with ample retail stores nearby, delivery drivers ply the streets, dropping off Amazon Prime boxes on the stoops of brownstones and in the lobbies of residential buildings. The dogma that new buildings should be places to “live, work, and play” emerged over the past few decades, as planners and city officials realized what urbanists like Jane Jacobs long argued: that shops mingling with other uses resulted in more vibrant neighborhoods. Jacobs, the author of “The Death and Life of Great American Cities,” saw Boston’s North End as an exemplar of a bustling neighborhood. As photographs from the 1940s and ’50s attest, the neighborhood was jammed with small shops — Polcari’s Coffee on the corner, Martignetti Liquors, Jack’s Shoe Store, and other storefronts advertising hardware, dry goods, and pastries. Pedestrians filled sidewalks and spilled out into the streets, many of them residents carrying daily necessities in shopping bags. 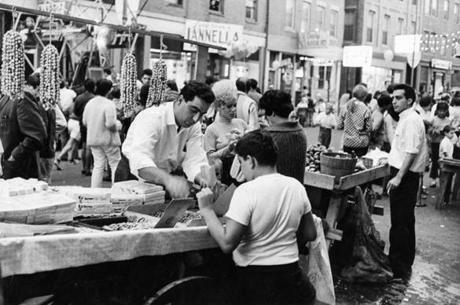 This kind of commerce shaped the physical layout of neighborhoods like the North End and the area now known as Downtown Crossing. Street-level retail is integral to our idea of a vibrant urban life, and it’s the kind of scene that urbanists want to recapture in today’s mixed-use buildings. But when you can have basic necessities delivered to your door, it means that retail has less power to enrich neighborhoods and nurture the kind of social world that Jacobs spoke of. “Placemaking” has become a popular buzzword in planning and real estate circles, just as making a shopping trip to a specific place becomes increasingly optional as a way of acquiring life’s necessities. So, are we building cities based on an obsolete vision of urban commerce? What does a post-Amazon future look like for urban centers whose neighborhoods are defined by their stores? Will e-commerce stunt them — or revive them? Street-level retail is integral to our idea of a vibrant urban life, and it’s the kind of scene that urbanists want to recapture in today’s mixed-use buildings. The city landscape today reflects how people have shopped through the years. In the early history of cities like Boston, small stores clustered in downtowns and squares with banks, public buildings, and restaurants, often with apartments above. Shops provided informal social spaces that anchored communities. Department stores first emerged in the 19th century; before they consolidated into chains, Macy’s, Marshall Field’s, and Jordan Marsh were icons of their downtowns. 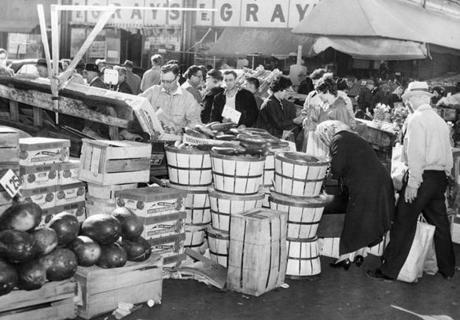 These enclosed marketplaces enabled women to shop and socialize unaccompanied by men, but also enforced class and racial boundaries. “They were created with middle-class white women in mind; they were the equivalent of a men’s club for white women,” says Traci Parker, an assistant professor in Afro-American Studies at the University of Massachusetts Amherst. When those women decamped to the suburbs throughout the 20th century, so did a lot of retail. As suburban housing exploded after World War II, retail reorganized to serve car-oriented lifestyles. First came strip malls, with small businesses anchored by grocery stores and parking. Later, self-enclosed malls turned shopping into a destination and a world unto itself. And beginning in the ’60s, big-box stores like Walmart undercut independent businesses with giant storehouses of goods surrounded by plentiful parking, often just off a highway exit. In the mid-20th century, department stores left behind in downtowns became battlegrounds for racial integration. Parker says that the struggle to participate in middle-class retail — both as consumers and as salespeople — was an overlooked goal of the black freedom movement. Retail jobs became a path to economic security for women, ethnic and racial minorities, and immigrants. By the mid-20th century, though, urban planning had come to emphasize separate spaces for working, shopping, and living — functions whose isolation from one another was soon codified with zoning, and could be bridged only by automobile. 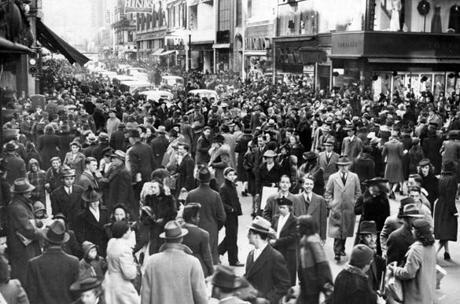 Later in the century, says Lizabeth Cohen, an American studies professor at Harvard, “there was this epiphany that what we were creating was a world where there would be downtowns with offices and commerce but no people, once stores closed and offices emptied out.” So-called “new urbanism” fueled an effort to recreate an earlier model of main streets and downtowns. Mixed-use developments can be seen as an attempt to suture earlier tears in the urban fabric left by 20th-century planning. Meanwhile, investment and affluent residents have returned to urban centers, and many of the showpiece malls in suburbs are struggling. While online shopping has introduced another disruption into this dynamic history, it won’t wipe out stores anytime soon. Jing Ren, an economist specializing in retail for CBRE Econometrics Advisors in Boston, says that store closings are driven more by large-scale economic changes, such as a move to urban lifestyles, than by online shopping, which accounts for just 9 percent of retail transactions. In fact, she points out, “the trend is more and more retailers see the value of the physical store.” Even Amazon and other online-first companies, such as the eyeglass manufacturer Warby Parker, are opening brick-and-mortar stores — generally in high-end locales. Discounters and dollar stores are prospering as well. But the Internet has applied selective pressure that’s forcing retail to evolve. “The Internet has been a very big positive for downtowns,” argues Robert Gibbs, an urban planner and retail expert in Michigan. Downtowns already have foot traffic. “It’s been a killer, though, for shopping malls.” Physical stores now have to compete with and complement online shopping; the buzzword in retail right now is “experience.” Think of the Italian market Eataly, which intersperses imported goods with specialty food counters, restaurants, and a wine store, all arranged like a rustic amusement park. Gibbs says that small retail stores can’t just offer standard goods you could easily get delivered; they need to offer something local, fresh, or luxurious, with excellent customer service. What’s outside the store is also important. “In order to compete with the Internet, the downtowns need to be beautiful,” he says. Stores themselves are shrinking. “We were just generally overbuilt,” says Rick Stein, a planner and founder of the Urban Decision Group in Columbus, Ohio. There are 23.5 square feet of retail per person in the United States (four times as much as in Britain, according to a report by the financial services firm Cowen and Company). Retailers are realizing “they can sell the same amount in about half the space,” he says. We’re still consuming as much as ever. So, it’s not the amount of goods circulating through cities that’s changing — just the way they reach us. Retail has long been an easy way for planners to revitalize main streets and make neighborhoods attractive. In his 1888 utopian novel “Looking Backward,” the journalist Edward Bellamy imagined Boston in the year 2000, and he described a shopping system in which goods are bought with credit cards and instantly whisked to one’s home via an underground pneumatic tube network from one of the city’s many warehouses. Today’s retail futurists have ditched pneumatic tubes for visions of drones flying with packages and self-driving delivery vehicles zipping around town. But the problem they’re trying to solve is the same. Stores are an efficient way to transfer goods from manufacturers to consumers. Today, double-parked delivery trucks and porches cluttered with Amazon boxes are the growing pains of an evolving industry. “I think we’re barreling toward a world in which we demand everything to be delivered to us in like an hour or less,” says Stein. That will require a new infrastructure. One thing Bellamy’s vision got right: the need for lots of warehouses. Instant delivery doesn’t happen by magic; it requires keeping goods in a distribution center as close to you as possible. The market for urban industrial real estate is growing as Amazon and other companies race to open small distribution centers filled with all the toothpaste, earphones, and running shoes that customers might be craving. In the future, Stein predicts, your local pharmacy might be mostly warehouse, with a small retail section in the front to bring in foot traffic. Residential buildings will increasingly need to be designed with ample storage for packages, and refrigerated areas for groceries. Single-family houses could also see changes; porches and garages could be repurposed to become secure depositories for deliveries. “There are already ways in which [e-commerce has] changed our urban landscape that we don’t even notice,” says Richard Markoff, a supply-chain researcher at the Swiss Federal Institute of Technology in Lausanne. Amazon lockers are now stationed in many metro areas, for instance, giving people near-home options for picking up packages. Markoff thinks that these costs will eventually be forced on consumers. As retail reorganizes to cater to online shoppers, it could leave behind those who can’t afford shipping fees, delivery tips, and Amazon Prime memberships. Inequalities in the retail landscape could also worsen, with lower-income neighborhoods getting more shuttered storefronts and dollar stores, and higher-income areas getting beautiful landscaping and cultivated “experiences.” Just look at the North End now: The shops full of sundries have given way to restaurants, bars, coffee shops, and high-end boutiques catering to tourists and the neighborhood’s wealthier residents. Retail has long been an easy way for planners to revitalize main streets and make neighborhoods attractive. Shopping is such an integral part of urban landscapes that it’s hard to imagine a bustling street without it. As people have fewer reasons to leave the house, it creates new challenges for creating vibrant neighborhoods. But it could also open up new possibilities. In the future, in addition to gyms and restaurants, shuttered stores could be reimagined as galleries, co-working spaces, and arcades. As we depend more on deliveries, miles of parking lots created for malls and big-box stores could be converted into housing, hotels, movie theaters, or green spaces. As the day-to-day buying and selling of stuff moves to the background, there may be room for something different on the streets. Courtney Humphries is a freelance journalist in Boston.